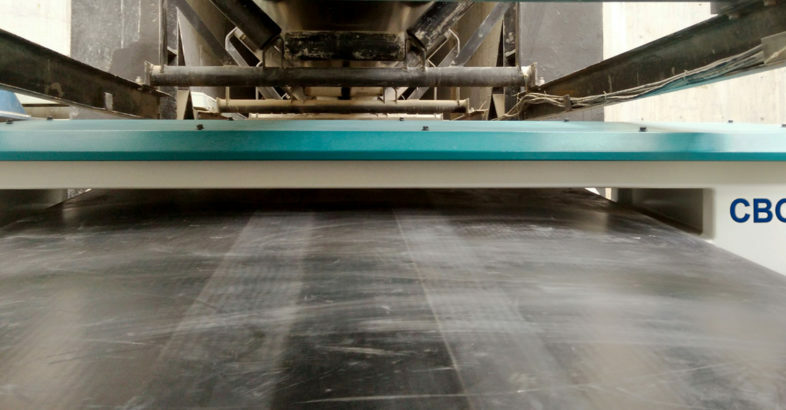 Most conveyor belts are subjected to exceptionally great stress from countless bends, material loading impact, from failing conveyor parts, or from foreign objects that may penetrate it. A failure or a severe damage of the conveyor belt often has dramatic consequences. It is essential to detect such failures immediately when they occur, in order to be able to take appropriate measures before things get worse. Monitoring systems based on radiographic technology, similar to those used in medical diagnostics, are well on the way of revolutionizing the safety and the operating efficiency of conveyor belts. This article describes the CBGuard® Life Extender system. Having a conveyor belt permanently monitored, obviates the need for time-consuming, insufficient visual inspections and temporary shutdowns of the conveyor system. The monitoring unit is permanently and exactly informing about the severity of injuries and deficits. Examples for such deficiencies are holes, scratches, edge damage, delamination, protruding cords and stuck foreign objects. Fatal errors, e.g. a belt break, causing dramatically high costs, can be avoided. Thanks to the live analysis, arising defects, not still visible from the outside, are detected at an early stage and can be repaired in a timely manner. Repairs can be performed at the optimum point of time. Not unnecessarily early and not too late, as would happen as the result of visual evaluation. The CBGuard Life Extender X6 measures the exact belt thickness and yields timely information about the upcoming need for a replacement. Hence, the maximum lifetime can be obtained from the conveyor belt. Serious damages, for instance broken or corroded steel cords, trigger an alarm, which advises the belt operator to carry out the repair as soon as possible. The X-ray unit is an important part of the preventive maintenance program. Extremely critical failures like the imminent opening of a belt splice or the slitting of the belt, automatically stop the belt drive. That way, dramatic consequential damages, for personnel and plant, are avoided. The software generates an intelligent, holistic analysis of any kind of threat to the belt. The current condition of the belt and of the splices is compared with the target condition. Any deviation triggers a customized action – from a warning to the automatic shutdown of the conveyor system. The program is intuitive and very easy to use. Remote servicing is possible anytime. Videos, partly or completely, or photos of any belt spot are available anytime. A complete report of the overall belt condition can be printed at any time. The CBGuard scanner is suited for belt widths of up to 3200 mm, a belt thickness of up to 60 mm and a velocity of up to 9 m/s. The device is very compact. It fits in almost all conveyors. The preferred place is in the bottom part of the conveyor. The belt needs to run flat through the device. A concrete foundation and a safety fence have to be provided. Only authorized, qualified personnel will have access to the system. The scanner itself is equipped with several safety devices. At the fence, about 2 m away from the generator, the radiation is equal to the normal environmental radiation. Before work on the device, it is switched off in the control room. When turned off, there is no radiation at all. The scanner is almost wear-free, because it neither has moving parts nor contact with the belt. The device signals in good time when the X-ray tube, which normally has a lifetime of some years, is about to be replaced. 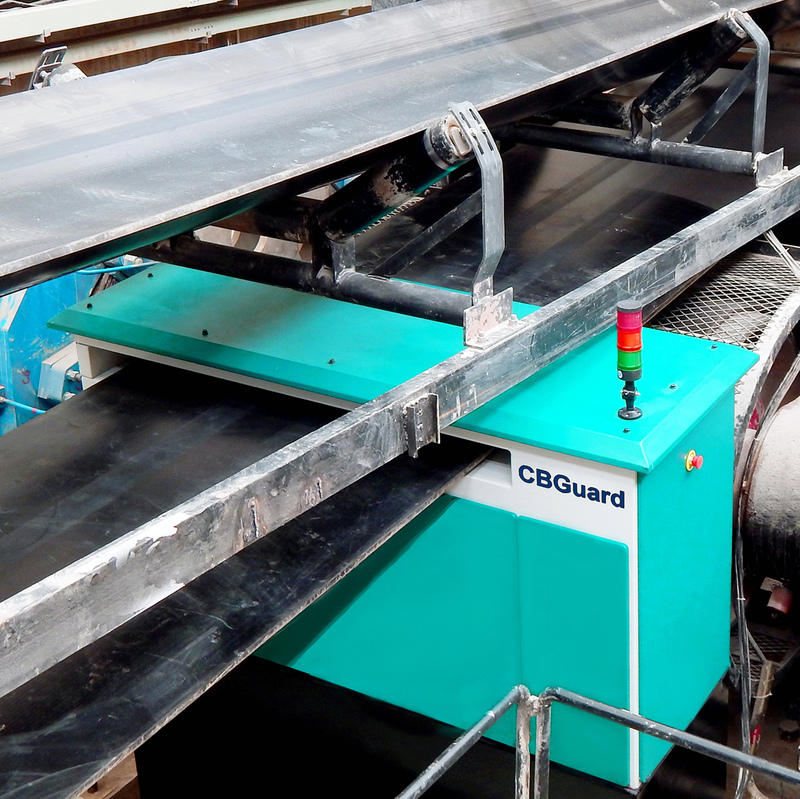 The CBGuard scanner digitizes the entire conveyor belt; virtually every cubic millimeter of the belt is captured. That way, the X-ray system can be integrated into the IIoT. 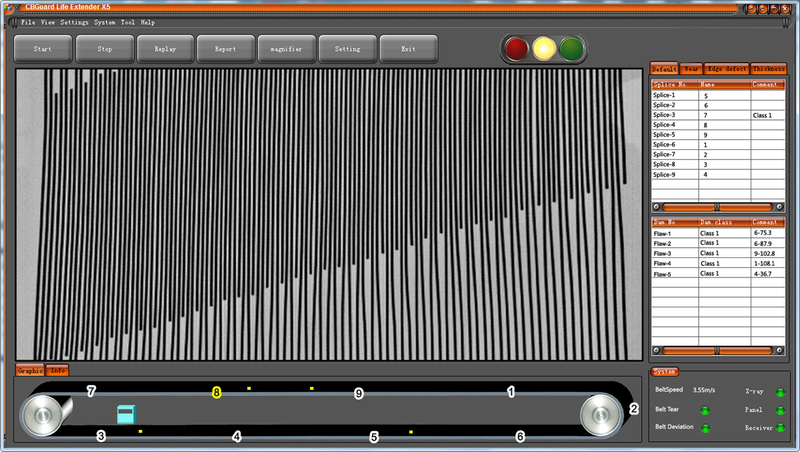 A reconciliation with the control units of other conveyor components is enabled. 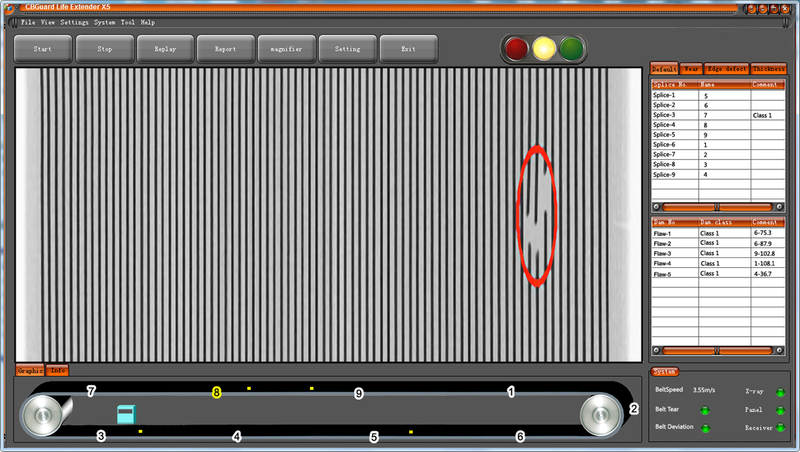 Since the X-ray even detects material build-up on the belt, it is possible to automatically demand corrections of the cleaning devices. In combination with other elements of the logistical chain, the optimal time of the next maintenance stop can be scheduled. The condition of the belt can be observed from any place in the world in real-time over the internet. The industry is in a new phase where the need for integration, innovation and holistic thinking to operate successful mines is replacing methodologies of the past. X-ray scanners are a central part in this new environment. The use of an X-ray belt scanner is recommended for all long or critical conveyors. Originally, the request for an X-ray system came from underground coal mining, because a visual assessment of the conveyor belt is difficult there. Under the Safety First rules, belts were replaced, because it was assumed they were not reliable anymore. Assets were burned because of lack of information. The X-ray scanner is particularly important for steel cord conveyor belts. Damages to such long and expensive belts can have catastrophic consequences. Meanwhile, there are hundreds of CBGuard X-ray systems operating in underground and surface mining, in cement plants and ports. X-ray technology in combination with sophisticated software has begun a triumphal march with regard to conveyor belt health monitoring. No other independently working system or technology is capable of providing and processing such a wealth of detailed information. The reduction in operating cost and the increase in safety are most convincing arguments for the implementation of these state-of-the art scanners. It is a very interesting article and the CB Guard scanner may be highly value adding particulary in opencast & underground mines, where long distance conveyors are used for coal & overburden transport. We are mining & engineering consulting company known as Indian Mine Planners & Consultants (IMPCON). Our website is http://www.impcon.co.in. We have got several years of experience of working in Coal India Ltd, which is the biggest coal company in World. Currently we are associated with various mining projects, where such kind of belt health scanner may be highly value adding. Kindly send us more details & also estimated price for our evaluation & further carrying forward on the your product. If you agree then we may also like to be associated as your Indian Partner for promotion of your product. We shall be very happy to receive your positive response. Gentlemen, along with salute we are a service company in maintenance of conveyor belts and we need you to send us the technical file of the equipment along with its value. This article is very interesting. How to analyze the conveyor belts is very well explained and the conclusion given is a noteworthy point. Thanks for blogging.